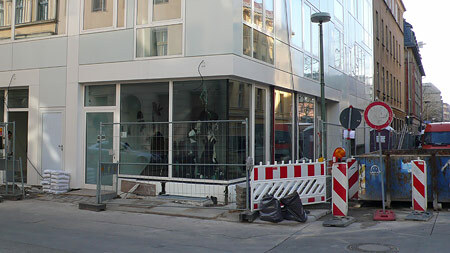 Back in November 2006, we laconically hypothesised that the ground floor retail space of the Gormannstraße building we later slated for being Â«disappointingÂ», would contain either a) a high-price fashion boutique where no one shops, or b) a WLAN-equipped café selling latte macchitatos under an obscure new name. We reported that either option would fully comply with rigorous local zoning laws. We were, of course, spinning a yarn, since no such law exists, at least in written form. However, we were also entirely right since a high-price fashion boutique where no one will shop has opened. This is the reason why Mitte is lobotomised: it is mind-numbingly predictable.